From the 1975 edition of Inside Today’s Home. “A vividly colored, streamlined kitchen forms one wall of the major group space in this minimal-care beach house. 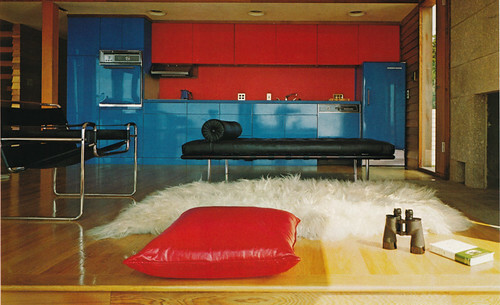 The brilliant blue and red scheme contrasts strikingly with the clean-lined Breuer and Mies van der Rohe furniture and a soft goat hair rug. John Fowler, architect.” Photo credit: Norman McGrath. This entry was posted on Monday, June 22nd, 2009 at 4:59 pm	and is filed under design. You can follow any responses to this entry through the RSS 2.0 feed. You can leave a response, or trackback from your own site. I was 24 years old in ’75 and remember seeing this photograph. Like the white and olive book cover on the floor next to binoculars. The architect John Fowler (1934-1974) was a design critic and also taught draughting at Yale School of Architecture and Cooper Union from early 1960’s until his death. He worked in Paul Rudolph’s office on the design & construction phases of the Yale A+A Building (now Paul Rudolph Hall). He designed a small number of fine houses and interiors on his own. He was one of the five finalists in the Yale Math Building Design Competition, which ultimately was won by Robert Venturi’s office (the project never was built). Fowler’s design scheme was “Stirling-esque”. Fowler was Assistant critic to James Stirling’s joint 3rd Year/M. Arch. Thesis Studio at Yale, which ran from Fall of 1969 to mid-January of 1970. Sadly, the Klema House (kitchen pictured here) is reported to have been demolished. The house was a 1969 Progressive Architecture Design Award winner and as completed was featured as cover story of the May 1971 P/A issue. Thank you! I knew none of that – very interesting, especially since I’ve featured quite a lot of Paul Rudolph’s work on this blog. I’m sorry this house has been demolished – like so many, including Rudolph’s. Thanks again for filling us in. This is a fantastic kitchen. I’d love to see more work like this.